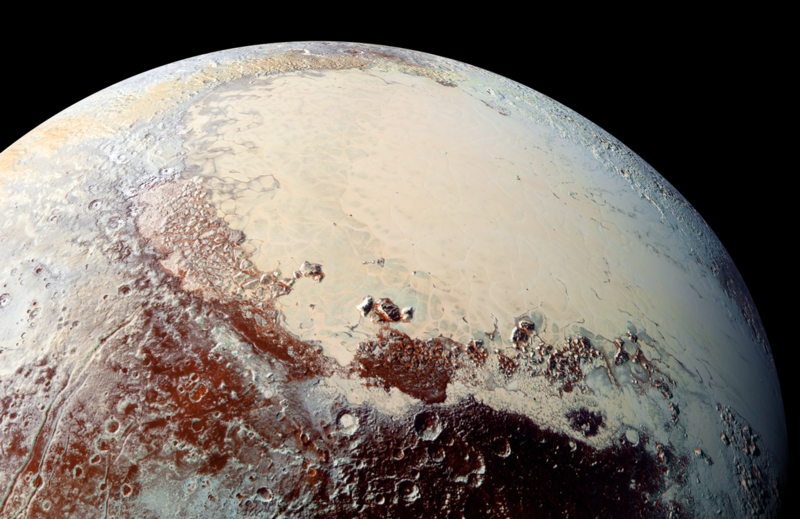 The 1000 kilometer-wide basin with the famous heart-shaped region on Pluto’s surface, Sputnik Planitia, could be located where it is today because a buildup of ice forced the whole planet to roll over, which caused cracks in the crust. These cracks suggest a subsurface ocean lies beneath them. Doctoral student at the University of Arizona’s Lunar and Planetary Laboratory, James Keane, and his adviser and assistant professor Isamu Matsuyama conducted a study and concluded that there is evidence of a frozen nitrogen pileup, which would compromise the entire planet’s weight equilibrium and throw it off kilter. This process is called true polar wander. Planets try to spin in the most energy-efficient way possible, and to accomplish this they can reorient themselves so that the area with the most extra mass is found at the equator and mass deficits are found at the poles. Whereas Earth’s axis is only slightly tilted so that its equatorial regions receive the most sunlight, Pluto’s axis is like a top lying on its side so that its poles receive the most sunlight and its equatorial regions are always cold. In fact, they are almost negative 400 degrees Fahrenheit, which means any nitrogen present is frozen solid. In the time it takes to make its full rotation (248 Earth years), nitrogen and other gases condense in the permanently shadowed regions, vaporize, and re-condense on the opposite side of Pluto. This causes seasonal snowfall on Sputnik Planitia.